COLORADO SPRINGS, CO — March 2019 — Virtual Industries Inc., the leading supplier of manual vacuum handling solutions, offers an ADJUST-A-VAC® ESD Safe Kit with foot switch, which is the ideal solution for handling thin and delicate substrates, wafers, MEMS devices, and other fragile components. The AV-6000-FS-SP8-BD-220 ADJUST-A-VAC® ESD Safe Kit with Foot Switch features five vacuum tip holders on top of the tool, rubber no-skid feet and a side-mounted handle holder. This vacuum-tweezer is easy to operate, allowing the user to adjust the vacuum level from just below atmospheric pressure to up to 10″ of mercury. The operator can see the vacuum level of the part being handled on the clear 10 segment bar graph display that is integrated into the device. The vacuum port also features a replaceable inlet filter that helps protect the tool from dust particles during operation. 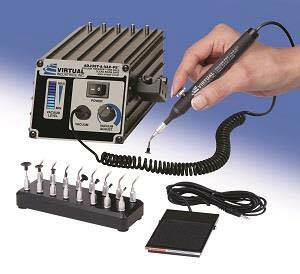 The AV-6000-FS-SP8-BD-220 ADJUST-A-VAC® ESD Safe Kit with Foot Switch offers 220 V operation. The kit includes a coiled vacuum hose, push-button vacuum pen, foot switch with vacuum pen without control hole, vacuum cup kit, ESD-safe Delrin small parts tips, 16 position tip organizer or holder, and a three wire power cord. Virtual Industries’ complete line of ADJUST-A-VAC kits are offered with or without the foot switch and are available in 110 or 220 V operation. For more information about any of Virtual Industries’ advanced equipment, visit www.virtual-ii.com. ### About Virtual Industries Inc. Founded in 1987, Virtual Industries Inc. is headquartered in Colorado Springs, Colo. For more than 20 years, Virtual Industries has been a leading supplier of manual vacuum handling solutions to the world’s hightechnology firms. The company’s patented ESD-safe products are used by CLASS I clean room personnel, electronics assemblers, semiconductor manufacturers, Universities and scientists globally. Virtual Industries’ success has come from developing innovative manual vacuum handling tools and pick-up tips based on customer requests and customer feed back. These tools provide customer specific solutions that make assembly and processing operations more productive and ergonomic. For more information, visit the company at www.virtual-ii.com.